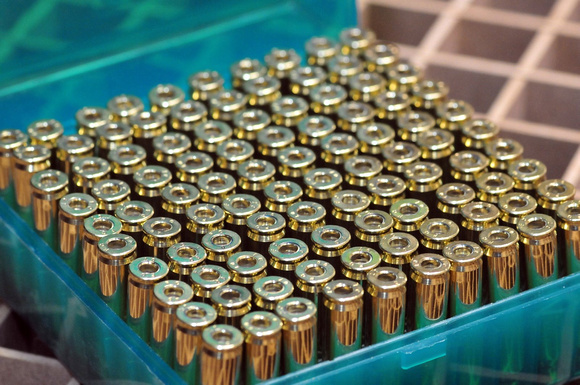 People often ask about reloading…they’ve heard of it, they understand that you’re “making your own bullets”, but that’s the extent of their knowledge. In fact, when I’m at the range and I ask the other shooters if they mind that I sweep up their brass if they aren’t going to use it…I’m often looked at like I’m some poor hobo asking for change (granted, you can catch me dumpster diving if I see match grade brass in the bin!). So I guess there is a basic lack of understanding of what reloading is and why we do it. Briefly, there are a few main reasons to reload. I’ll expound more on reloading in future articles. #1 Saving money! Granted, there is a bit of an initial investment in the tools needed to reload your own ammo, but when you factor in that you can save 40%-60% over a box of factory ammo, the equipment can quickly pay for itself and everything after that is just icing. #2 Precision! What? You think the factory “match” ammo is the end all, be all of accuracy and consistency? Remember, the factories are making ammunition that works in everyone’s guns, at the cheapest they can, and still be safely within SAAMI specs. Where as you can go on with your OCD self and dial in consistency four digits past the decimal, tuned *exactly* how your firearm likes it…all while saving 40%-60% per round. That’s precision! #3 Relaxing. Yes, absolutely. Some people veg in front of the TV, some go to a spa, while I personally really like sitting down at the reloading press with some of my favorite tunes in the background, and churn out the finest ammo I can; all while day dreaming about how relaxing it’s going to be to hit the range and practice. #4 SHTF/Survival/Preparedness/Manlymanness (yes, that’s far from being a word, but it fits here). Seriously, for those of you who are prepping (and/or wishing) for The End Of The World As We Know It (TEOTWAWKI), wouldn’t it be a great skill to have handy? Hell, I even know people that swage their own projectiles from brass scraps and lead wheel weights! Who probably isn’t going to be reloading? Too busy, have money coming out your ears, or too easily distracted? Reloading takes time, dedication, concentration, and organization. If your time is really that valuable, and you can afford it…then just buy your ammo in bulk and be happy. Just make sure you pass on your brass to those of us who reload! If you’re one of those people who can’t keep things straight in their head, can’t put things away when your done, or doesn’t notice that you’re wearing a blue sock, a red sock, and you forgot to put pants on today…maybe playing with gunpowder just isn’t for you. Really though, reloading your own ammunition can be dangerous if not done correctly. Least of your worries is jamming up your gun, the worst…blowing it up by doubling up on the amount of powder you were supposed to use. With care, reloading is safe and relaxing, and saves you a bunch of money (or lets you shoot twice as much!). People have been reloading metallic cartridges themselves since they were first invented, and we’re still around to tell about it. So if you do decide to “roll your own”, find a mentor or take a class; you’ll find it very rewarding.